This chapter is about how Western musical tradition treats pitch, and why. Since pitch is primarily heard (by most people) in terms of ratios of frequencies, it is natural to use a logarithmic scale to assign pitches (which are subjective) to (objective) frequencies. But one has to pick a scale, that is, a ratio that corresponds to one unit of interval. This ratio in the West is the twelfth root of two, approximately equal to 1.059. That particular number turns out to be such a good choice of interval to measure pitches by, that it came to rule over a millennium of Western art music. Although we won't be concerned with all the historical details, this chapter will try to explain what's so special about the twelfth root of two as a unit of pitch. The punch line is that this particular logarithmic scale turns out to have a surprisingly high number of sweet-sounding intervals in it. To develop this idea we first have to figure out what makes some intervals sound sweeter than others; this is pretty well explained by what is known as the Helmholz theory of consonance and dissonance (section ). Then we will investigate the actual intervals that arise in the Western scale (section ). Finally we'll consider some of the consequences of the way pitch is organized in Western music and consider some alternative ways to organize pitches. SOUND EXAMPLE 2: a tritone (sour by comparison). To call these sweet and sour is a rather clumsy metaphor. In musical language, we refer to a sweet-sounding interval as consonant and a sour-sounding on as dissonant--terms that can be taken to mean ``going together" and ``not going together". (Even this more neutral-sounding terminology carries an implicit value judgment that should not be accepted unquestioningly.) It turns out that the two intervals above have a physical difference that correlates with people's judgment of consonance and dissonance (as they are measured by psychoacousticians in experiments), that fits into what we know today as the theory of consonance and dissonance. Although the theory of consonance and dissonance is usually associated with Hermann von Helmholz (1821 - 1894), many of its ideas and concepts date back further, even to ancient Greece; and the theory was much elaborated upon (and argued with) over the century since Helmholz published his contributions. The theory seems to have finally been brought to a definitive form in Plomp and Levelt's very readable and persuasive 1965 paper on the subject. These pictures roughly correspond to the two sound examples above. The first one is consonant and the second one, dissonant. The Helmholz theory explains the consonance of the first example and the dissonance of the second one, by the absence or presence of awkward pairs of sinusoids (in this example there are two: 280 and 300 Hz, and 400 and 420 Hz.) These pairs are far enough apart to be perceived separately but close enough to interfere with each other by vibrating in heavily overlapping regions of the cochlea (Section 3.4). Under this rule, the two pairs of sinusoids in the dissonant example above are almost as dissonant as possible (20 Hz. being close to 1/4 of a 100-Hz. 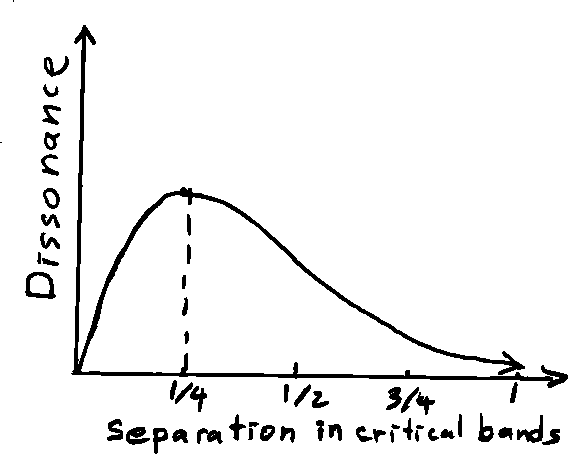 critical band). The wider separations in the first example are about 1/2 of a critical band and contribute much less dissonance. It's unavoidable that multiples of two fundamental frequencies would give rise to close neighbors here and there. The special reason the closely placed harmonics that occur in the first example didn't contribute to dissonance is that they landed right on top of each other. For this to happen, the ratio between the two pitches must be an integer ratio. For instance, for the third harmonic of one tone to coincide with the second harmonic of another, the fundamentals must be in a 2:3 ratio. In many situations it's a good, practical move to choose, out of the set of all possible musical pitches, a reasonably small set of pitches, called a scale, to which you would restrict yourself when writing music. One reason for this might be that instruments, such as pianos or fretted guitars, are often designed to play a discrete set of pitches out of the whole continuum. (But if we consider that vocal music predates the development of keyboard and fretted instruments, this may cease to seem a compelling reason). Another consideration might be that you would want to be able to write music down. It would be impractical to write all the pitches as numerical frequencies, so in practice (in the West as well as elsewhere) musical traditions have settled on sets of pitches, typically between 5 and 21 in an octave, out of which a working musical context might use 5 to 7 at a time. For example, the Western scale has 12 pitches per octave, and one often chooses a musical key which implies a choice of 7 out of the 12. Now for instance if we decided to put five steps in an octave the available intervals would be 0.2, 0.4, 0.6, or 0.8 octaves; we see that three steps gives us an approximate fifth with an error of octave. If, instead, we divide the octave in six parts, the closest interval to the fifth we can find is octave for a much larger error, 0.081 octaves. and the worst possible mis-tuning is then 1/4 of that (according to the Helmholz theory) or 0.06 octave. So our 6-tone scale, with its error of 0.081 octaves, has about the sourest fifth you could ask for. Whether this is a reasonable result (i.e., whether this interval should be regarded as consonant) is more a matter of taste than of measurable scientific fact. Some people complain about it, and some instruments (brass and voice, for instance) have a tradition of slightly altering a pitch here and there to make thirds sound more consonant when they appear in the music. A quick look at a piano keyboard will suggest (and a few minutes spent studying the way pitches are represented in Western musical notation will amply confirm) that the twelve steps of the octave are not considered equal; instead, they are organized in a highly non-uniform way that at first seems highly non-intuitive. If someone had asked me to design the piano keyboard I would have simply put the even-numbered keys on the bottom and the odd-numbered ones on top; that way, once you learned to play a piece you could quickly transpose it to another key just by moving your hands right or left. But there is deep wisdom--learned over a thousand years or so with many spilled tears and even some blood--in the layout that we now use. With the benefit of hindsight, we can see why things are as they are in a fairly simple way, and although we shouldn't forget that there are rich historical resonances here, we can cheerfully leave them for a course in music history and confine our own study to the acoustics of the situation. All the 22 pitches shown appear as evenly spaced stripes on the right-hand side of the diagram. These are the pitches of the 12-note-per-octave Western scale. For historical reasons, and somewhat over-poetically, this is called the chromatic scale. On the left-hand side of the keyboard you see only seven out of every twelve pitches; these are labeled A through G. (The labels repeat because pitches that are separated by an octave are given the same label). They are the piano's white keys, and they comprise the diatonic scale, so named because they are (mostly) spaced two steps apart.. The seven pitches per octave that make up the diatonic scale are called naturals (as in ``G natural") to distinguish them from the other five, which are called accidentals. Accidentals are named for an adjacent natural, as in ``D sharp" (the pitch between D and E) or ``D flat" (between C and D). These seven pitches (F, A, C, E, G, B, and D) can be re-ordered to get the pitches (A, B, C, D, E, F, G) that we know as the diatonic scale. By convention this scale is often arranged in the order (C, D, E, F, G, A, B, C) (repeating the C at either end of the scale); in this form it is called the C major scale. This scale has many wonderful properties, but perhaps the most important is that, if we shift the entire thing by a fifth, we get back almost all the same notes. To see this we'll go back to its arrangement as three major triads, as in the diagram, and shift upward in pitch. Because we designed it as three major triads joined end to end, the first five pitches (forming the first two triads) land on other notes in the scale. Of the other two, the D shifts up to an A (you can check this by counting up 7 steps from the middle 'D', landing on 'A'. The B, however, lands on F sharp, the pitch between F and G. The new, shifted scale has the pitches (C, E, G, B, D, F sharp, and A), or, in letter order, (A, B, C, D, E, F sharp, G). Going further, we can shift the scale up or down a fifth, an arbitrary number of times, by changing one pitch in the scale for each shift. Shifting a musical scale (or a chord, or an entire piece of music) by a fixed interval is called transposition. Starting again with the pitch F, we now consider what happens if we repeatedly transpose it (but just F now, not the whole scale) by a fifth. We get the pitches (F, C, G, D, A, E, B, F sharp, C sharp, G sharp, D sharp, A sharp, F)--after which, being back at F, the sequence repeats. We ended up hitting each of the twelve pitches exactly once: first all the naturals, then all the accidentals. This arrangement is called the circle of fifths, and it sends music theorists into paroxysms of joy. The Western chromatic scale is not without its discontents, who often complain about the poor accuracy of approximating major thirds as four twelfths of an octave. We can fix that if we are willing to relax the requirement that our scale have equal steps. (In fact, we could then do anything we wanted). Although it's easiest to relax and let the modern Western scale rule over your music, the investigation of alternative pitch scales has been, and continues to be, an exceedingly fruitful avenue for composers including Harry Partch, Alvin Lucier, Charles Dodge, John Chowning, and Rand Steiger (and certainly many others), who have found highly individual ways of organizing sets of pitches. 1. In the Western tempered scale, if A is tuned to 440 Hz., what is the frequency of the C below it? 2. What is the frequency of the same C, under the same conditions, using the just-intoned scale in C instead of the tempered one? 3. How many half-tones, in the Western tempered scale, are there between the fundamental and the seventh partial? If the fundamental is tuned to a note on the Western Scale, how far is the nearest note on the scale to the seventh partial? 4. How many distinct major thirds can be formed using the 7-note diatonic scale? (Count two of them as being `the same' if they differ by an octave). 5. What is the frequency ratio (as an exact number) between B and the next F above it in the Western tempered scale? 6. How many half-tones is the syntonic comma (as defined in Section 4.4)? Now do the same things with pulse trains. You'll need the "pulse" object which is in version 2 of the Music 170 library (a folder named m170-function-library-v2, uploaded Oct. 15) - if you have version 1 get the new one (and change Pd's path or your working directory accordingly). When you've got it updated you can type "pulse" into a box to make a pulse generator. Make two of them, frequencies 440 and 330, with "BW" (bandwidth) set to 2000, and connect them to an "output" object as you did with the sinusoids. Now reduce the 330-Hz. one to 329. What do you hear? Now reduce it further until it sounds sour. How many Hz. less than 330 did you have to go? Was it further away than the tempered fourth (329.628)? One could think that the number of Hz. you have to mis-tune an interval to get sourness might be a constant or else that it might be a constant proportion (i.e., interval). To find out, repeat the experiment for 220 Hz. and 165 Hz. Again, decrease the lower frequency (165) until you think it sounds sour. How many Hz. did it take and is it more nearly the same frequency difference or the same proportion?